Last night was hubby’s Christmas party. What a great night we had!!! Great food at our local Boston Pizza and a bit of fun bowling. ( yes we live in a small town so no glamours party at a convention center) My hat is off to his company for doing the responsible thing and providing taxi vouchers for everyone to come home. As you can imagine, the booze was flowing and this morning has been a bit rough. Thank you caramel bailieys and coffee for giving me the strength to move today !! Also it was the first night since Celeste was born that we have gone out on our own. Well it feels like it anyway. It was nice to view my husband as my partner and lover for a few hours instead of my co-parenting room mate. Let’s be honest here, as a couple with children, we loose that part our lives. It takes a lot of work to keep up on the love side of the relationship when you are arguing about what is appropriate behaviour for a 3 year old and what she should have for dinner. Spending quality relationship time with your partner is a great foundation to a long lasting marriage and I am vowing now to make a bigger effort to do so. You all as my witness’!! 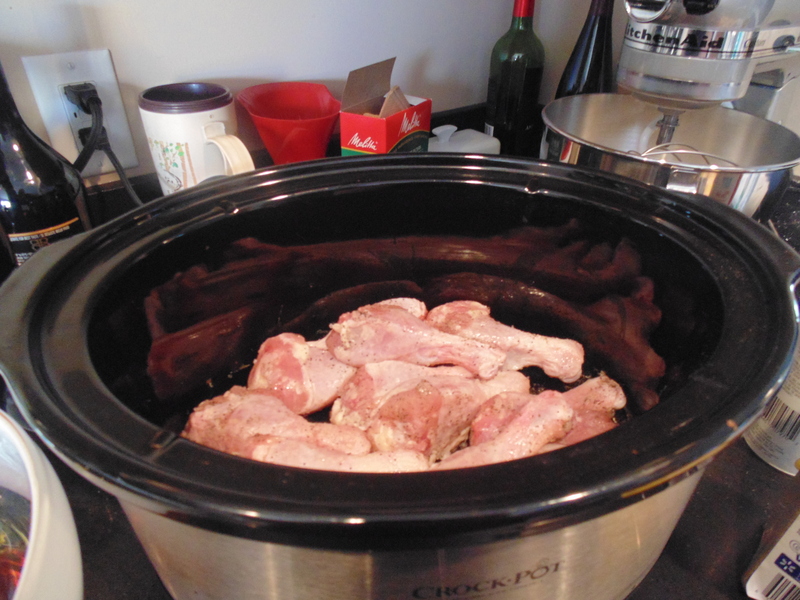 In light of the rough wake up this morning I decided that I would pick a meat from the freezer then hop on the web to find something easy and crock pot friendly for dinner tonight. ( if we all make it that far!! ) So I grabbed some chicken wings and decided to make Honey Garlic Chicken wings. 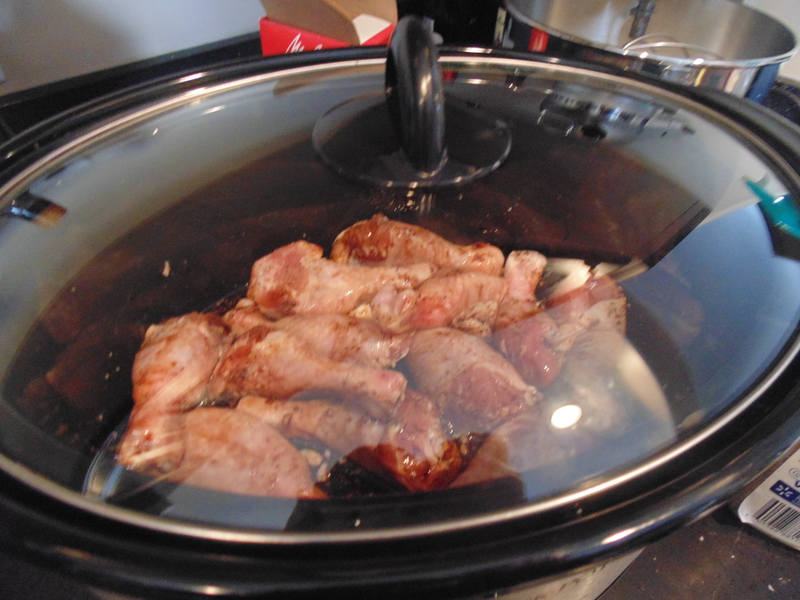 I found a great recipe at http://crockpotladies.com/recipe-categories/appetizers/crockpot-honey-garlic-chicken-wings/. I did make very minor changes ( I hate when you read a recipe and then the comments are full of how they completely changed it to suit their taste!! It is no longer the same recipe folks, you made your own and should maybe just list what you did!! ) I used refined organic coconut oil instead of just canola oil. It is better for you and you will not taste the coconut so why not. 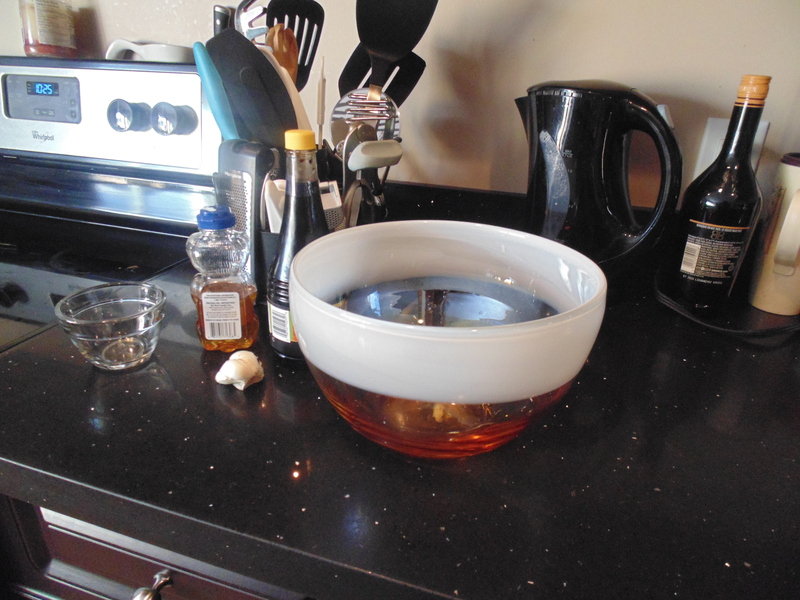 And my wings probably won’t be quite as sweet because I did not have a full cup of honey on hand only about half a cup. This is not a bad thing in my house hold as hubby does not like sweet things. I totally forgot to take a picture of the finished product! I am so very sorry, however I will give you a visual description. 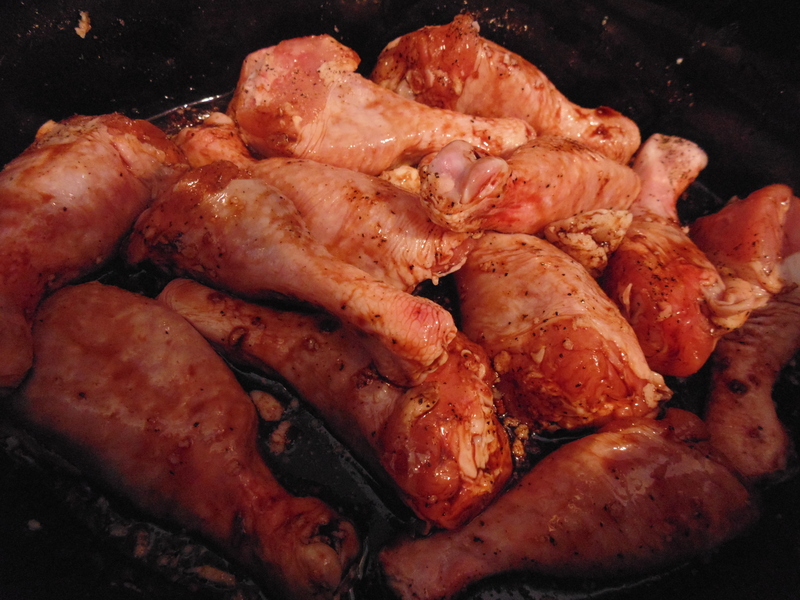 The skin was cooked and coated in sweet yummy goodness. The chicken fell off the bone and the house smelled like garlic and honey. The meat did become black after a while, which can be a turn off and probably wouldn’t have happened had I not left it on warm for a couple of hours after the cooking time was finished. It was a hit all around and I will defintley make it again. I threw together a veggie stir fry to serve with it. I included all the old veggies I had lying around and it was awesome!! Such a hit that the roomie took it for lunch the next day and the next! 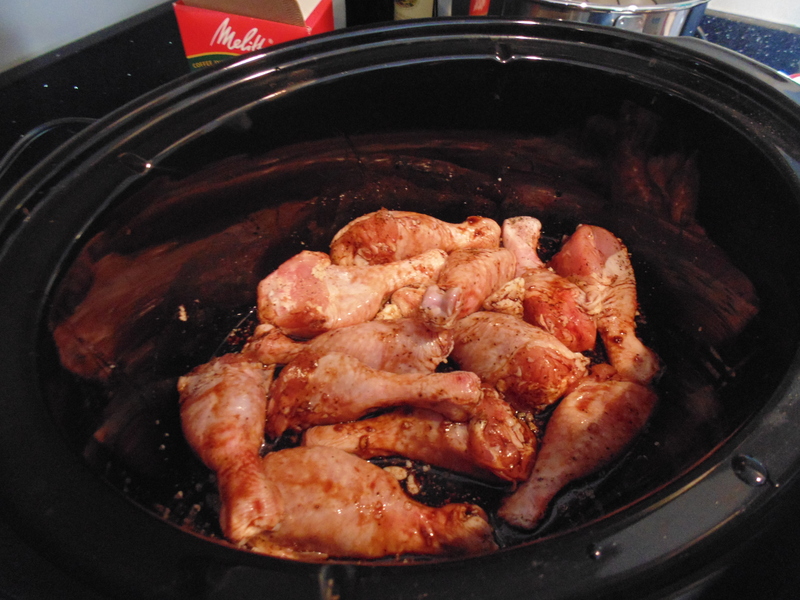 Another winner in my crock pot book.